At the TU Dresden (Dresden, Germany), a 3D printing process was developed for the combination of thermoplastic resins with continuous reinforcing fibers and simultaneous utilization of material-inherent functionalities. Through targeted continuous fiber reinforcement, for example with carbon fibers, the structural properties of 3D-printed plastic components can be increased. 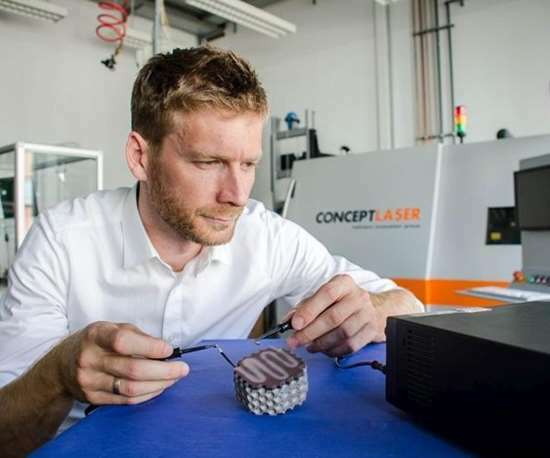 At the same time, the thermal and electrical properties of the carbon fibers make it possible to selectively influence the 3D printed component, for example to adjust adaptive stiffnesses within an intelligent structure. This makes it possible, for example, to improve compliant structures in folding roofs or awnings for space travel. In addition, structures can be specifically heated, for example, for integrated de-icing in wings or for controlling the temperature of bioreactors. For this, the electrical conductivity of the carbon fiber in the 3D printed component is used for direct heating by Joule heat, which leads to a temperature rise in both the carbon fiber and in the surrounding plastic. With the simultaneous use of special thermochromic plastics that change color as a result of changes in temperature due to molecular changes, a corresponding temperature monitoring can be integrated directly into the 3D printed multi-material component. So the plastic changes its color if too high a temperature sets. In addition to the development of novel additive manufacturing technologies, the researchers are developing suitable strategies and procedures for integrating the additive-fabricated structures in the multi-material assembly. Thus, generative manufacturing technologies for multi-material lightweight structures as well as associated tool technologies and pre-treatment measures are being researched and tested. In the process, the first methods have already been developed that enable efficient integration of the additive-fabricated structures in assemblies in mixed construction, for example in combination with metallic materials such as titanium or stainless steel.